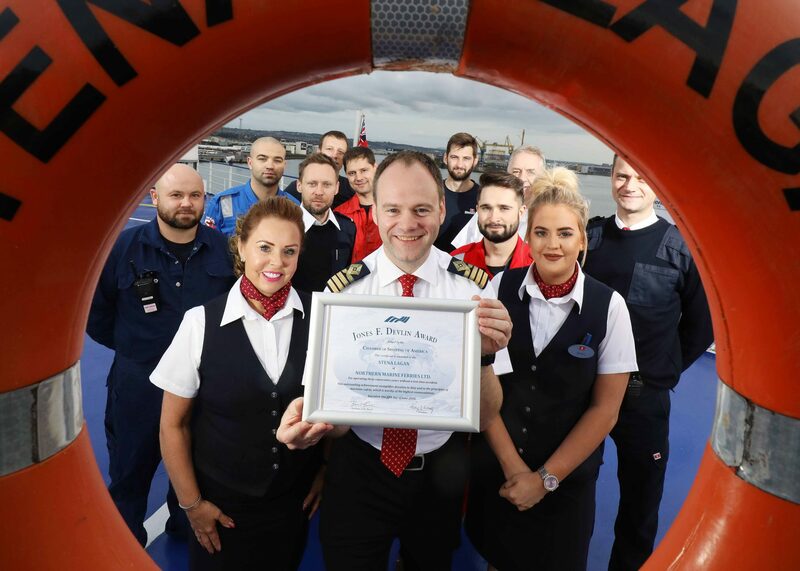 SAFETY FIRST: Captain Steve Millar and crew members from the Stena Lagan celebrate receiving the prestigious Jones F. Devlin Award. A total of eight Stena Line ferries operating on the Irish Sea have received the prestigious Jones F. Devlin Award from the Chamber of Shipping of America (CSA), acknowledging the skills and dedication of the men and women responsible for safe vessel operations. This year, eight Stena Line ferries on the Irish Sea, along with a ninth ship operating on the Gdynia to Karlskrona route have been recognised for operating between two and five consecutive years without a lost-time accident. “Safety for our passengers and employees always comes first at Stena Line, and forms a very important part of the Stena Line Group’s strategy for a sustainable future. This achievement reaffirms the positive trend we have seen in the Lost-Time-Injury-Frequency during the last years,” stated a delighted Bjarne Koitrand, Technical Operations Director at Stena Line.